Immersion is a key reason why many consumers love engaging with gaming. And AR and VR alike can make game experiences even more compelling and interactive, in ways that were—until now—impossible. VR in particular brings gamers one step closer to the immersion. However, VR is currently limited by cumbersome setup and expensive hardware requirements. For this reason, VR experiences have more potential on console and PC, rather than on mobile. AR, on the other hand, has boundless potential on mobile, with Google and Apple investing heavily in AR—through ARCore and ARKit, respectively. To help uncover the AR and VR opportunity, we recently created a report together with Arm. In the report, we look at these technologies in depth, delving into their landscapes, future potential, consumer interactions, and what they mean for mobile. Download it for free. We have outlined some of the report’s key findings below. The AR landscape mostly centers around games and applications on Android and iOS. As you can see in the image below, HoloLens and Magic Leap are the two main headset options, but their high cost positions them as a better fit for enterprise applications. Meanwhile, AR consumer devices are simply AR-capable smartphones. Games or apps with AR features are distributed in the same fashion as traditional apps—via Google Play or the App Store. 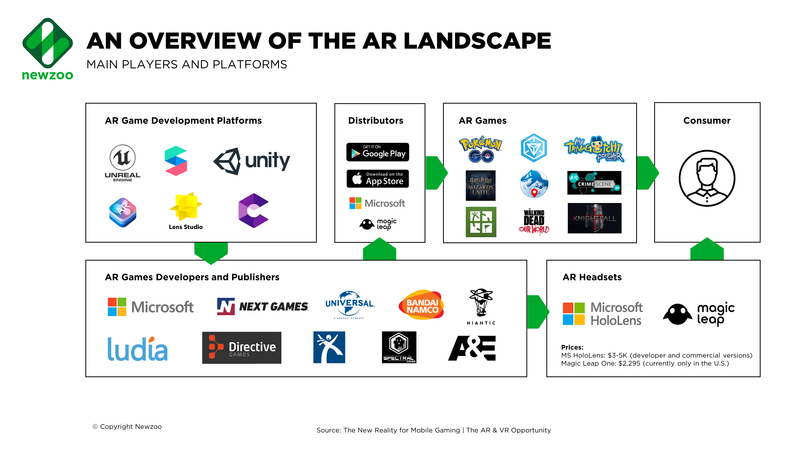 The full report features a deeper dive into the AR ecosystem, as well as a panoramic look at the VR landscape. Download it for free here. We recently looked at the apps on iOS and Android that include ARCore/ ARKit in their descriptions. On iOS, games make up 25% of AR app downloads, making gaming the most popular AR category on the platform, followed by lifestyle (20%). Productivity apps are popular among iOS users. The main purpose of these apps is to help facilitate people’s daily life by, for example, keeping track of tasks, communicating with others, and accessing and sharing information. Examples include Google Translate, Mind Map AR, AR Plan 3D, AR Ruler, Torch AR, Vuforia View. In terms of the number of apps available on iOS, shopping and productivity grew the fastest from H1 2018 to H2 2018 (53% and 43%, respectively). Gaming is also the #1 AR app category on Google Play. 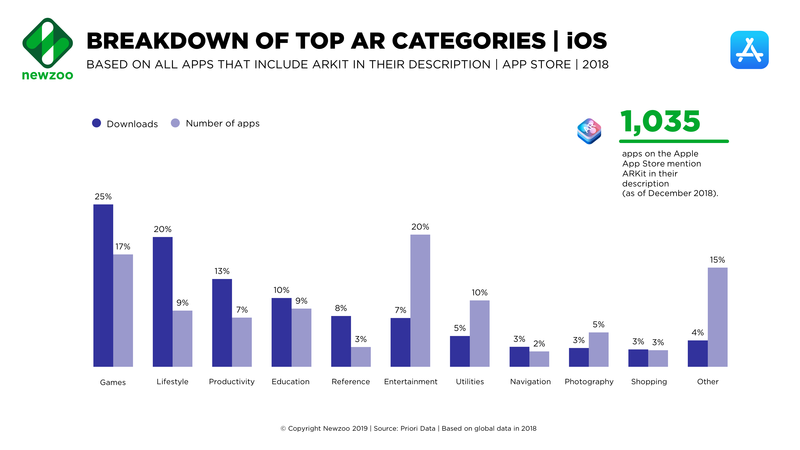 The full report boasts a breakdown of top AR categories on Google Play and further insights into the top AR apps on iOS, and the highest revenue AR games on iOS and Google Play. Download it for free. VR, which tilts more toward console and PC, has less potential on mobile. High-end VR headsets require peripherals, which add a vital extra layer of immersion. While there are plenty of low-cost options to turn your phone into a VR headset (e.g., Google Cardboard), interaction with the environment is limited. 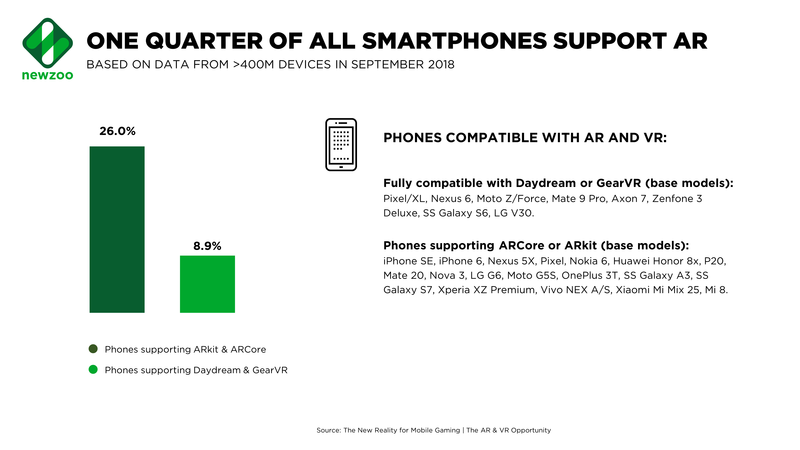 Daydream and GearVR are two of the most popular options on mobile, but they are only compatible with high-end devices, which make up a smaller slice of the smartphone market. In fact, Newzoo’s Global Smartphone and Tablet Tracker shows that only 9% of smartphones in use are compatible (based on September 2018 data). However, many new mobile devices released going forward will have AR/VR support. AR is currently a better fit on mobile, but support for the official development kits from Apple and Google (ARKit and ARCore, respectively) is still limited. In September 2018, 26% of active devices were able to use either SDK. Google, in particular, has to optimize the kit for specific devices and currently supports a set of more than 100 devices. That might seem reasonable, but there were more than 7,000 Android models in use in that same time period. Although, Google has been steadily adding new device support each month, slowly expanding ARCore’s reach within the world’s most-used mobile operating system. Mobile has introduced the world to AR and VR tilts toward console, but what’s next? The full report looks at what the future holds for AR, and VR diving deep into barriers to growth, applications beyond gaming, and more. Download the report in Newzoo Website.